It is all but impossible to pinpoint one key problem in the U.S. economy — manufacturing declines, global competition and international economic tensions could all be cited. But the intractable housing mess clearly sits somewhere near the center of the larger problems. The September foreclosure numbers from the firm RealtyTrac show a housing problem that is stalled at best and far from recovery — slightly better than August’s overall numbers, but worse than July’s. The numbers remain especially high in Patchwork Nation’s Boom Town counties and in Latino-heavy Immigration Nation, but also above the national county average in the wealthy Monied Burbs. Those persistently high foreclosure numbers are keeping home prices low, and the low home prices are making owners less likely to sell. That helps create the latest problem in the system: a low inventory of homes on the market for those who actually want to buy. It is a difficult set of problems to fix and it is prompting the federal government to consider a new plan that would help people who are “underwater” in their homes (they owe more than their house is worth). Looking at our Patchwork Nation communities, something like that kind of plan might help nudge the housing market forward. A lot of people are in a situation where they can’t move without taking a massive hit financially. But whatever happens, a turnaround looks a long ways off. as long as we have writing about it. The robo-signing issue, where banks pushed homes into foreclosure without the proper paperwork, ultimately slowed the process down. 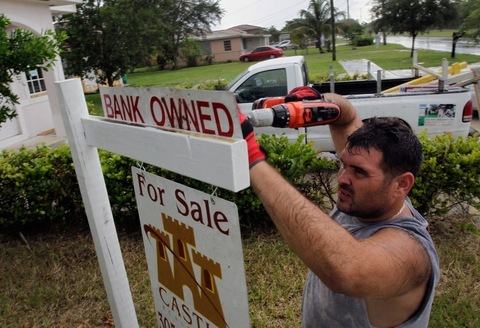 Banks stepped back from processing foreclosures. The relatively high foreclosure rates in the wealthier communities — the Boom Towns and Burbs — are particularly concerning. Those places have high disposable incomes and they’re less likely to spend when they see foreclosure notices plastered around town. If they don’t spend, the consumer economy is likely to remain stalled. You can see the impacts of foreclosures close up when you look at some of the communities Patchwork Nation has been visiting for the past four years. Eagle, Colo., a Boom Town in Patchwork Nation, has seen its home median value plummet from $499,000 in January 2008 to $302,000 this August, according to Zillow.com. It was $353,000 in August 2010. Nashua, N.H., a Monied Burb, had a median home value of $246,000 in 2008 and $195,000 in August, according to Zillow. Clark County, Nev., the home of Las Vegas that is in many ways a prototypical Boom Town, has seen home values fall some 33 percent in the last three years. Out of the 12 communities Patchwork Nation regularly visits, only Sioux Center, Iowa, an agricultural Tractor Country community, and Ann Arbor, a Campus and Careers county that is home to the University of Michigan, are essentially unchanged in the past three years. People in much of America feel poorer and less willing to spend because, in fact, they are poorer – at least on paper where their home valuations have dropped. And every month of flat or slowly rising foreclosures only emphasizes that point. And the housing crunch has compounded the unemployment problem. If you bought a home when times were good and now live in a town with high unemployment or a place where your line of work isn’t hiring — construction, for instance — you aren’t easily able to just pick up and move. The federal plan currently under discussion would no doubt help the situation some, but how much and how soon? Even if it reduces the debt that underwater homeowners face and gets the housing market moving again, there is still a lot of housing inventory to eat through. But don’t expect to hear that over the next year or so. True or not, it’s the kind of deeply unsatisfying answer that no politician wants to utter and no voter wants to hear.